Don’t want to make the mess at home? Or just need to use some supplies? Come check out our new Crafts Center! Open during business hours, $3 per hour. Sign up to teach a class today! 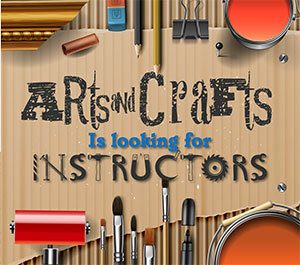 The Arts & Crafts Center is looking to hire instructors to teach classes on a variety of crafting activities, such as photography, wreath making, scrapbooking, card making, painting, crocheting and more. We provide a wide range of custom framing. Order 4 or more of the same design (with same material) and receive a discount. The Engraving Shop can engrave a wide range of wood, metal, glass, and acrylics. Our custom shadow boxes make great promotion and retirement gifts. All orders have a three-week completion time. Drop-by or call for details.